Happy Bloggers Challenge Friday! Thanks to those who played along with last weeks To Die For Challenge. This weeks Challenge theme is Backgrounds- use stamps, sprays, stencils, the Gelli Arts plate or something similar to create your own background for your project! Sorry to appear to be MIA this week with my blog postings, but my muse had other plans and decided to take a brief vacation! Nothing like a little background creating to get your muse going again! 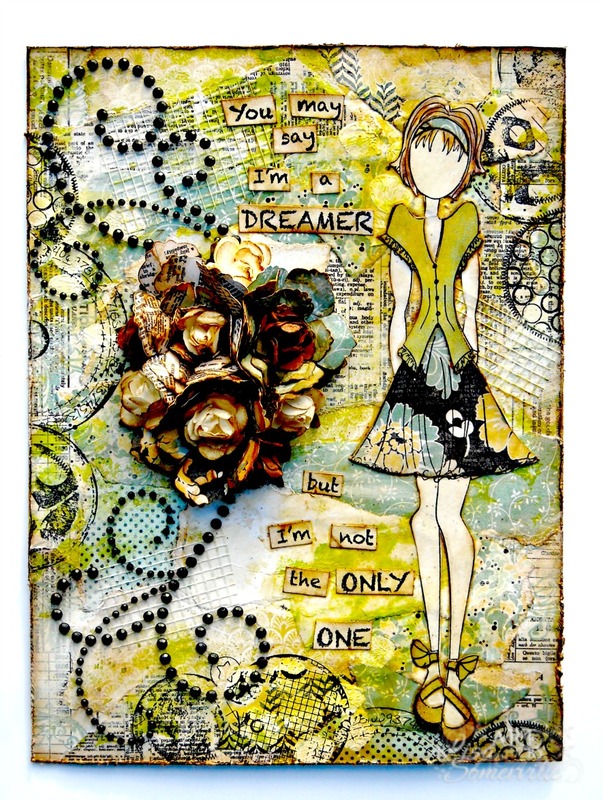 I created a Mixed Media piece for the challenge, creating my background with papers from Authentique, Gesso, stamps and stencils from Just a Trace. I'll be back later with a tutorial on how I created the background. I'm back with the tutorial! First, I should tell you, never let your husband talk you into taking Benadryl when you are working on a tutorial, that was the reason I didn't get the tutorial up last night. Anyway, here's the finished piece it measures 8" x 6". Here's what I started with, my Mixed Media Paper (8" x 6") and the Julie Nutting Paper Doll, that I paper pieced with Authentique pattern paper. Her hair is colored with STAEDTLER Ergo Soft Colored pencils, all edges are sponged with Gathered Twigs Distress Ink. Apply Gel Medium to Mixed Media Paper, then add torn pieces of your favorite pattern paper - I used the Authentique pad that coordinated with my paper pieced image. Continue adding strips of pattern paper until your background is completed. Trim away any pattern paper that extends over the edges. Use a Sponge Dauber and Gathered Twigs Distress Ink to age your pattern paper and edges. Using your fingers, apply Gesso to the background to tone down and blend the papers. For the next two steps, I wanted to add some texture to the background and didn't have any Modeling Paste. I searched DH's workbench for Drywall Compound and came up empty handed so had to settle for extra layers of Gesso. Randomly add a few pieces of Drywall Tape to the background panel as desired. Place stencil (I just the Dangle Stencil from Just a Trace), onto background and apply Gesso through stencil using fingers. Good thing I didn't just have a manicure, as my fingers were covered in Gel Medium, Gesso and Stain by the time I was done! Remove stencil and heat to dry Gesso. Repeat as desired. Place stencil over background and spray with Mist of your choice. Don't waste the overspray on the stencil, simply flip it over and add to different areas of your background. Repeat process as desired. Let dry or heat set. Finished background piece - use as desired. I applied Ranger Mustard Seed Distress Ink over the Stenciled Gesso. To add to the background, I randomly stamped circles in Black Archival using a stamp from Art Gone Wild. Because I was working with such a large canvas, I add some Zva Creative Black Crystal Gems, Zva Creative Mini Roses and Flowers I created using the Silhouette Cameo, to embellish the background and fill in space. 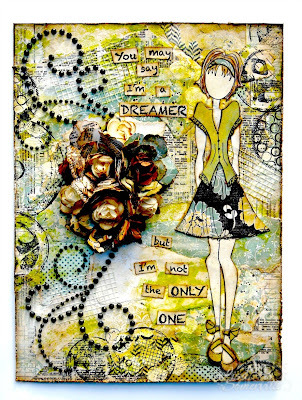 The paper pieced Julie Nutting Doll was added to the canvas with Gel Medium, the quote is one of the many fabulous quotes that can be found on the Artistic Outpost Chalkboard Wisdom plate. If you'd like to play along with this weeks Bloggers Challenge, please link back to this post on your blog and mention you created your card for the Bloggers Challenge Backgrounds Challenge. Please add your link using the Link Tool below, your link should be a direct link to your Bloggers Challenge Post, use your name as the Title. Please do not link to cards that were created prior to the challenge date. Entries not linking properly, or backlinked will be removed. If you have the captcha enabled on your blog, please consider turning it off, as it makes it so much easier to leave comments. This is gorgeous!!!!! I love it!!! What a gorgeous piece, Lisa. Love your BG! Just beautiful, Lisa! Love the look of the background you created. As usual I love the background - obviously your muse wasn't too far away!!! Love the card! She is a beauty! Love her outfit today, and the glorious bg! This is fabulous. The background is amazing. Love it. FABULOUS!!! Thanks for the visuals- I love the colors! And, Yipee- I made a card for the BC challenge- finally! beautiful card, loving the paper piecing and the detail of the background is just stunning!